Mini Cooper fans are going to love this. 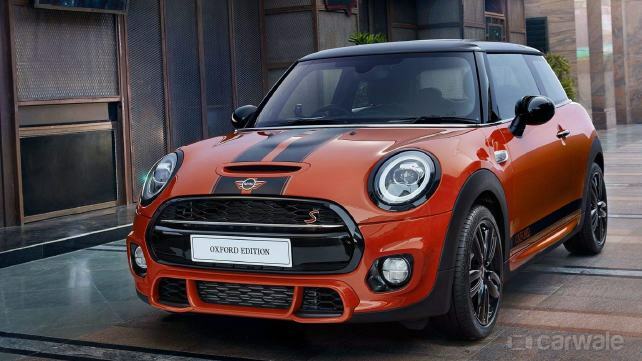 The Oxford Edition of the Mini Cooper is now available in India. This limited edition is based on the classic three-door Cooper S model and pays a tribute to the brand’s British heritage. It’s a stylish take on the hot hatch that proves to be a stand out in terms of design and exclusivity. Feast your eyes on this picture gallery of the Mini Oxford edition. This special Oxford edition of the Cooper will be limited to 25 units in our country and offered in two colour options – 15 in solaris orange and 10 in midnight black. The surrounds around the headlamps, radiator grille and tail lights are blackened out instead of chrome. Featuring black door handles and fuel filler cap, the ORVMs are painted in black or orange. A contrasting roof and matte black decals on the bonnet and on the sides are subtle changes that might not catch your attention. But what’s definitely eye-catching is the John Cooper Works rear spoiler and an aerodynamic kit. Also, the 17-inch alloy wheels finished in black and twin chrome exhaust tips are quite appealing. Oh yes, and there’s an overload of the Union Jack badging that can be found at various places on the exterior like the tail lights and side scuttles. This national flag of the UK can be seen inside the cabin too on the steering wheel, door sill finishers, leather upholstery, illuminated dashboard and even the LED door projection. What’s new is an 8.8-inch touchscreen infotainment system with a touchpad controller. This unit is a Harmon Kardon audio system with 12 speakers supporting Apple CarPlay connectivity and navigation. Powering the Mini Oxford Edition is a 2.0-litre, four-cylinder turbocharged petrol engine churning out 189bhp and 280Nm of torque. It comes mated to a seven-speed dual-clutch automatic transmission. Sport and Green are two driving modes the car comes equipped with. Apart from this an auto start/stop function with brake energy recuperation, active cooling air flaps and a head-up display is standard. The Oxford Edition is equipped with many safety features like airbags, ABS with brake assist, Dynamic Stability Control, traction control, Crash Sensor and Cornering Brake Control.